Best Karaoke Machines for Kids and Adults! What are the Best Karaoke Machines for Kids and Adults? Are you looking for the best karaoke machines on the market? Do you believe you are the next American Idol? I used to throw karaoke parties all the time when I was younger…. My husband and I used to be professional karaoke singers and we had a karaoke party in our house every weekend! We had a blast! (*Now you can be the star of your own music videos with this easy to use karaoke machine! It comes loaded with over 2,000 songs!! This karaoke system is perfect for any home! Very cute, very easy to use, will provide you and your family with hours of fun!! Everyone will have a blast singing! I believe the best parties are the ones that have a karaoke machine! They are so much fun! Everybody enjoys a karaoke party! A good karaoke machine doesn’t have to be the most expensive one. It needs to have a nice, clear sound, show the lyrics, of course, and be easy to use! Singing is a great stress reliever too! Grab that microphone and step on the stage! Here I gathered a few of the best karaoke machines I found. A karaoke machine is also a great gift for someone that loves singing! Are you looking for the most fun and most popular karaoke machines for parties? Karaoke parties are the best parties ever! All you need to throw a nice karaoke party is a nice karaoke machine, some karaoke singers and a few cool drinks! I used to be a professional karaoke singer and party entertainer with my husband and we always had a blast! We also had a great karaoke system, (which you will find it here too) and we always threw awesome karaoke parties several times a year! Karaoke can make any kind of party so much fun! Kids love it and adults love it too! We have done weddings, birthdays, Christmas parties, graduation, baby showers, retirement parties, welcome home, housewarming parties and just fun family gatherings! The minute you plug that karaoke machine in and start singing, magic starts happening! Singing is so much fun! I decided to create this page today because I think a fun karaoke machine also makes an awesome gift idea for anyone of any age who loves to sing! Here you will find the best karaoke systems for adults and children! Let’s have some (singing) fun! 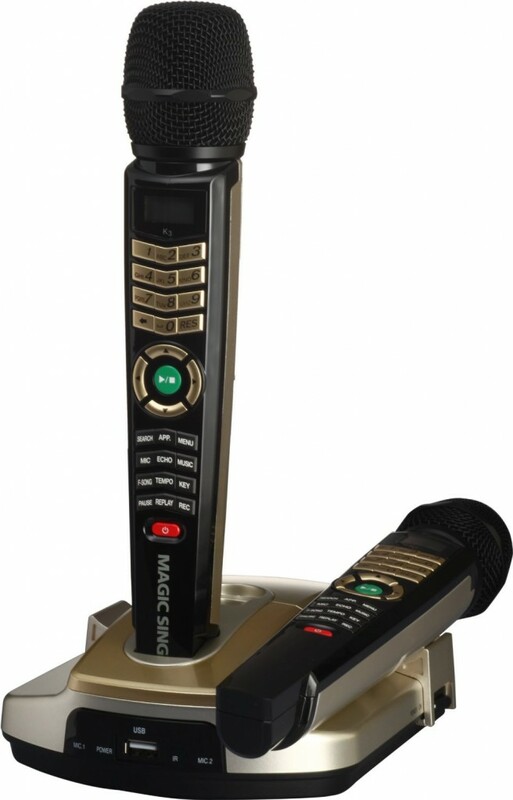 Magic Sing Karaoke Machine with 2 Wireless Microphones! 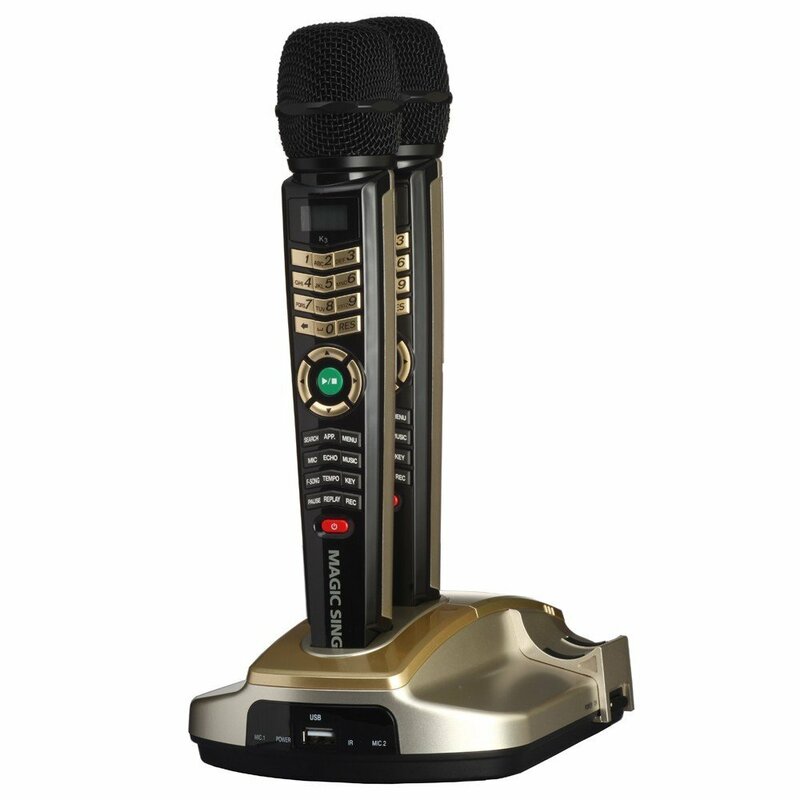 This is one of the Best and Most Popular Karaoke Machines for Home Use! If you are looking for a great karaoke machine to use at home and throw fun parties, look no further! The Magic Sing karaoke machine is one of the best karaoke systems for home being sold right now! It is very portable, as you can see, which is perfect for taking it with you to other people’s houses too! This Magic Sing karaoke machine comes packed with 2045 English songs already, it is very portable, (as you can see) and it comes with two microphones! Of course you can also put more songs on this machine, using the chip expansion slots. It is very easy to use, just connect it to your TV! This is the perfect compact karaoke machine that doesn’t require buying any CDs. That is a big plus for a lot of people. The song choices are super varied and will please almost everyone! You can search the songs by title, singer or by the number. Happy buyers also love the fact that they can take this fun karaoke machine to their friends and family houses. Overall it was rated 4 stars by buyers. 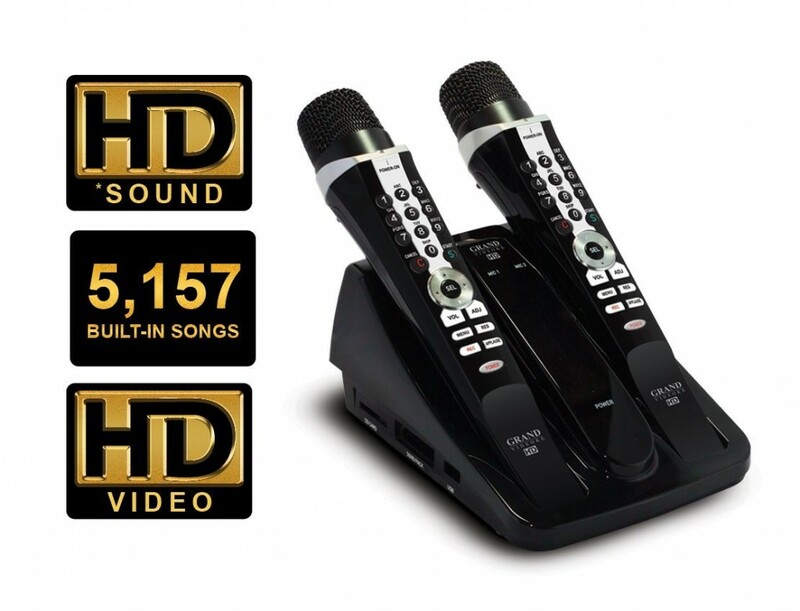 GRAND VIDEOKE: Great Portable Karaoke Machine with 5157 Built-in Songs! The best karaoke machines are the ones that are easy to take with you anywhere! How easy and portable is this one? Whether you like to sing only 70’s, 80’s, 90’s or only the newest hits on the radio, this videoke machine has it all! You can also sing with back-up vocals or live instruments too! You will definitely going to be the star of your party! Can you think of a more fun way to entertain any birthday party than with a fun karaoke machine? This is a very popular portable karaoke machine for sale. It has over 5,000 built-in songs and over 6 hours of cool video backgrounds, which is more than the Magic Sing. It also comes with two wireless microphones and a remote control. The sound quality is very, very good (it is HD quality!) and a happy buyer said it’s almost like ‘studio quality’! You can also change the key and the tempo, to fit your singing abilities. Since it’s also very portable, you can always take it with you when you get invited to parties! *Here it is! The Grand Videoke! Fun and Affordable Karaoke Machine for Sale! If you are looking for a fun, good quality but affordable karaoke machine for your kids or yourself, then you are going to like this cute karaoke system with a 7 inch color screen and record function! It is very affordable and the color screen is very easy to read, even when singing from a distance. It already comes with 300 songs and it also plays any DVDs and karaoke CDs as well. It has over 140 reviews by buyers and it was rated 4 stars. It makes a great gift idea for kids who love to sing! 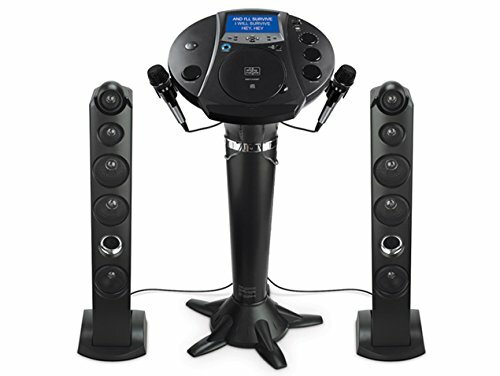 Now I present to you one of the most popular and most bought fun to use karaoke systems for home! 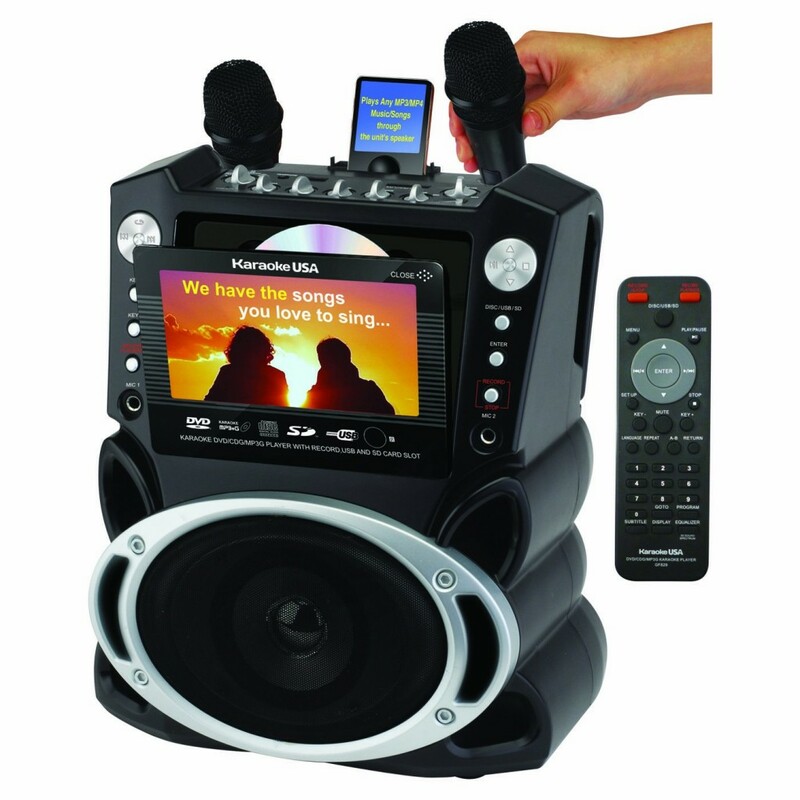 This singing machine karaoke player looks great, it is very affordable and it has a cool 7 inches monitor! I love how ‘tall’ it is, which is perfect for singing and reading the lyrics! This is one of the most fun to use karaoke machine to have at home! Great gift idea for pre-teens and teenagers who to sing! You can also connect it to your big screen TV if you want to make it even more fun! It also has a radio! And of course you can also connect it to your Ipod! 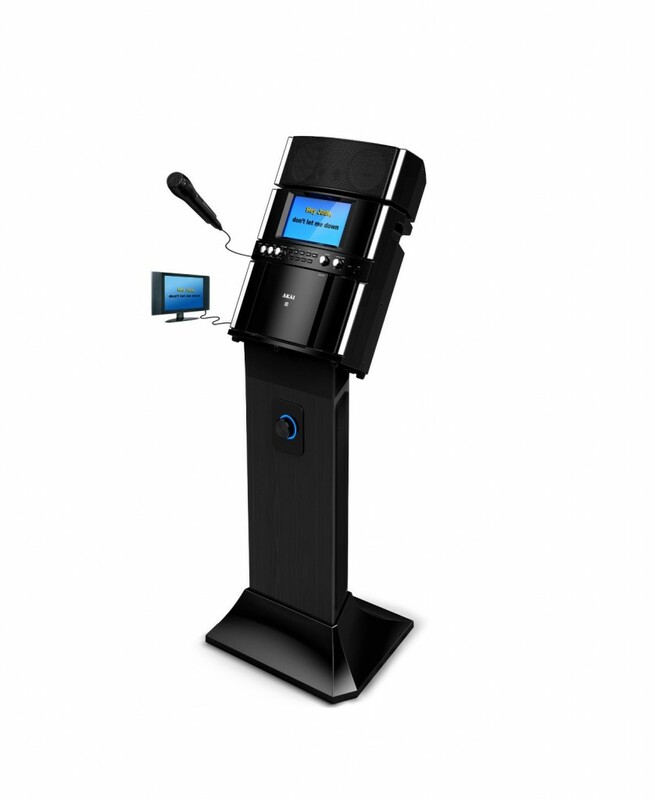 This cool singing machine karaoke player is also very popular specially because it has a cool pedestal and a nice 7 inch monitor as well! Kids love this fun singing machine because it makes them feel just like a real rock star! It also plays regular AM/FM radio and it comes with two microphones. I love the way this machine looks! Another great feature is the Ipod dock, which allows you to go on Youtube and also look for cool karaoke songs to sing. Overall it is very easy to use and a fun karaoke machine for the price. Check out this family setting up heir new Singing Machine! 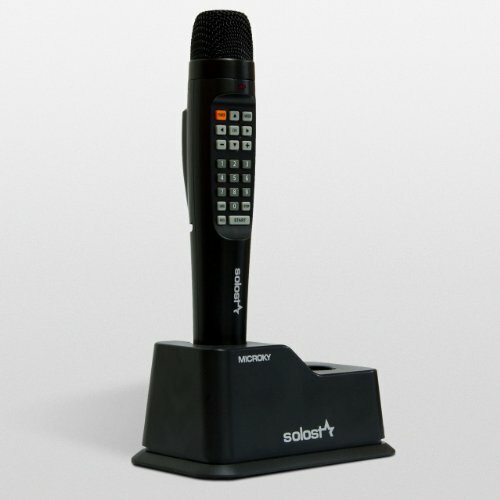 MICROKY SOLOSTAR Karaoke Machine with English and Spanish Songs! Fun Karaoke Machine for Bilingual Families! 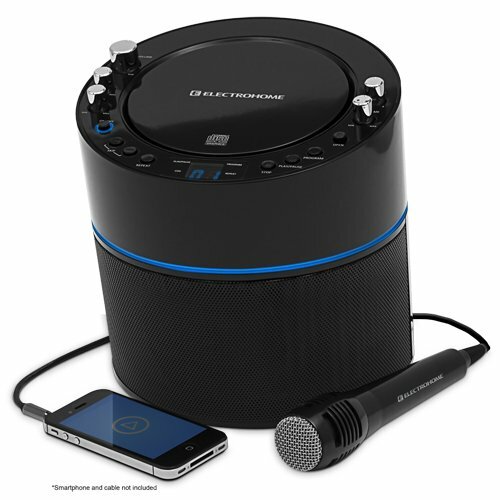 The best karaoke system for home needs to be portable and come filled with thousands of songs! You are not going to believe this, but this portable karaoke machine for home comes with almost 5,000 songs! Very easy to start enjoying too, just plug on your TV and start singing! I love the real time scoring feature! That means as soon as you finish singing you will get a score on your performance! This portable karaoke machine is also perfect for bilingual families who speak English and Spanish! It comes with 3,000 English songs and 1,700 Spanish songs! Can you imagine going through all the songs? That’s a lot of singing! Happy buyers say they are totally happy with this machine! They love the video backgrounds and they say it is perfect for kids too! The whole family can sing together! (Here is the pdf file with all the songs! It also has 5 expansion lots if you want to add even more songs! 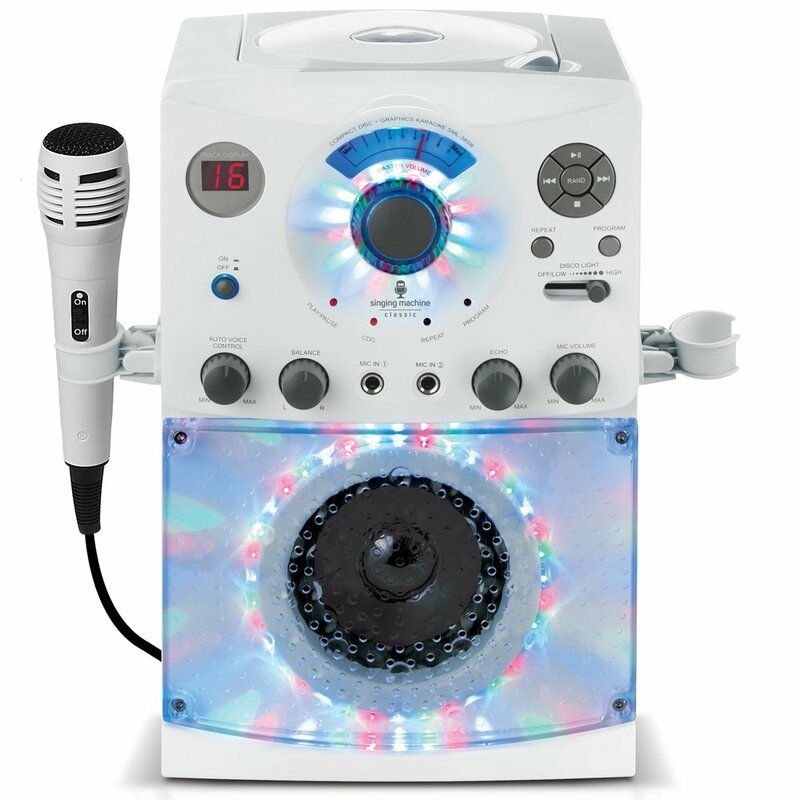 If you are looking for a fun and portable karaoke machine to use at home or take to your friends homes, this is a great option! You won’t need any software, CDs or DVDs. The coolest feature is the real-time scoring! Great way to practice for your next American Idol or The Voice audition! Awesome Karaoke System Jukebox for Home! I love this karaoke machine! Powerful crisp sound, practical, very portable, an excellent choice overall! It’s also FUN to use! This karaoke system is the one I used to have when I worked as a karaoke singer for parties with my husband. 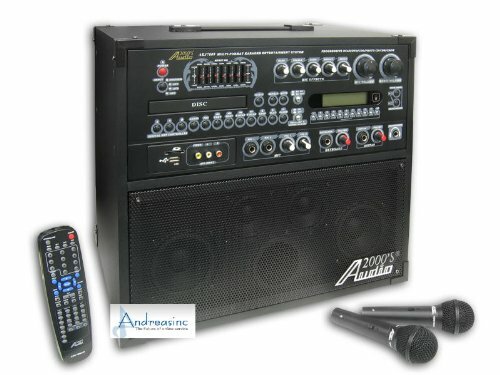 It is one of the best karaoke machines for parties because it has a 40,000 song capacity! I had over 20,000 songs on this machine but I guess I never got to sing them all! This karaoke machine was ‘my best friend’ for several years! Every single ‘free time’ that I had at home I would be singing! It comes with 1,000 built-in songs already and then you can add more songs directly into the hard-drive. Everything glows in the dark and it’s pretty cool for parties! The sound is amazing, even better if you also plug it into an amplifier! When we had parties at our house we usually had to invite the whole block, because it is that loud! It never ever gave me any problems whatsoever and I miss it dearly! The sound is amazing, it really sounds professional! We had the best karaoke parties ever! I definitely recommend this awesome karaoke machine for anyone who loves singing at home! One day I plan on sound-proofing one of my bedrooms though, so I can have my karaoke machine back! Check this lady singing on her new karaoke system! Great karaoke machine for weddings! One of the most powerful karaoke machines! Who is going to ‘American Idol’? Practice your singing with the ‘All-in-one’ karaoke machine! You can record your performance with this one!! It is perfect for aspiring singers! The best way for you to improve on your singing is for you to be able to record yourself singing and then listen to your performance! This monster karaoke machine is also perfect for weddings or large parties! The sound is absolutely powerful and great!! You will have everyone participating with this machine for sure!! Monster High Portable Karaoke: Fun Karaoke Machine for Kids! 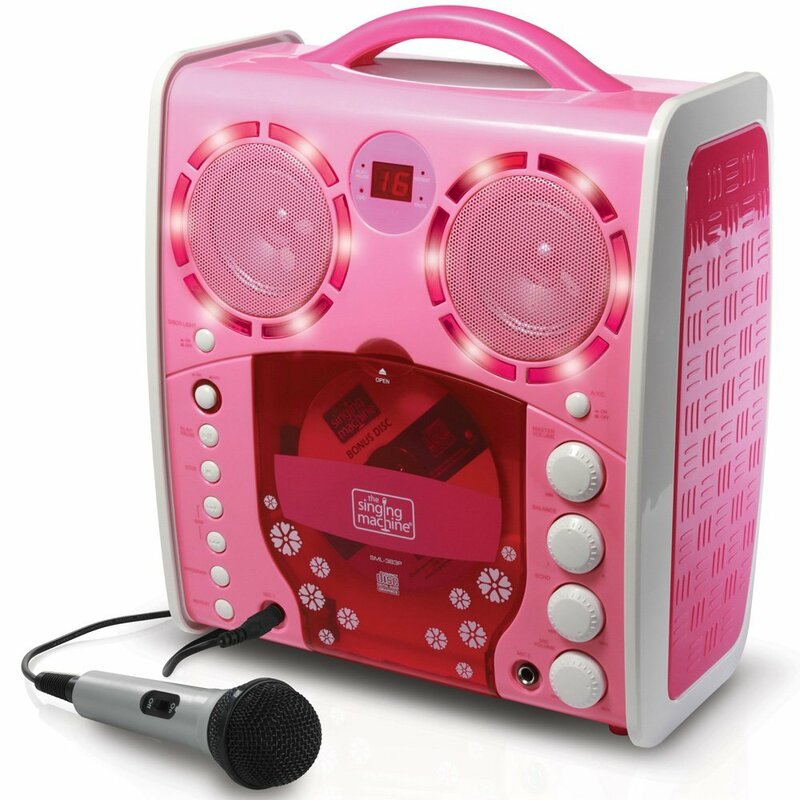 This is a very cool pink portable karaoke machine for kids! It has a built-in speaker, it comes with the microphone, it has a very cool 5 inch black and white monitor to show the lyrics and it looks cute! I think it makes a super fun musical gift idea for girls who also love to sing! Perfect for musical play dates! 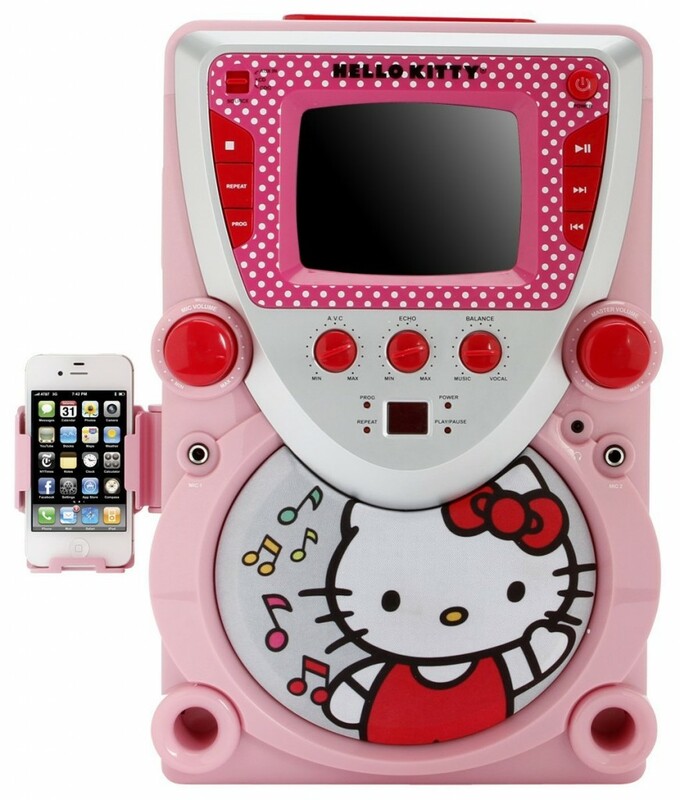 This is a very cute and lots of fun Hello Kitty karaoke machine for girls ages 3 and 4 to about 8 or 9 years old! It has a small screen showing the lyrics and also a video-camera, so they can record themselves singing to watch later! They love this fun feature and it makes them laugh a lot! It comes with one microphone but you can also buy another one if you want, since it has a dual input. You can also use batteries if you want to take this cute machine somewhere. Fun Singing Machine Karaoke Player for Children! 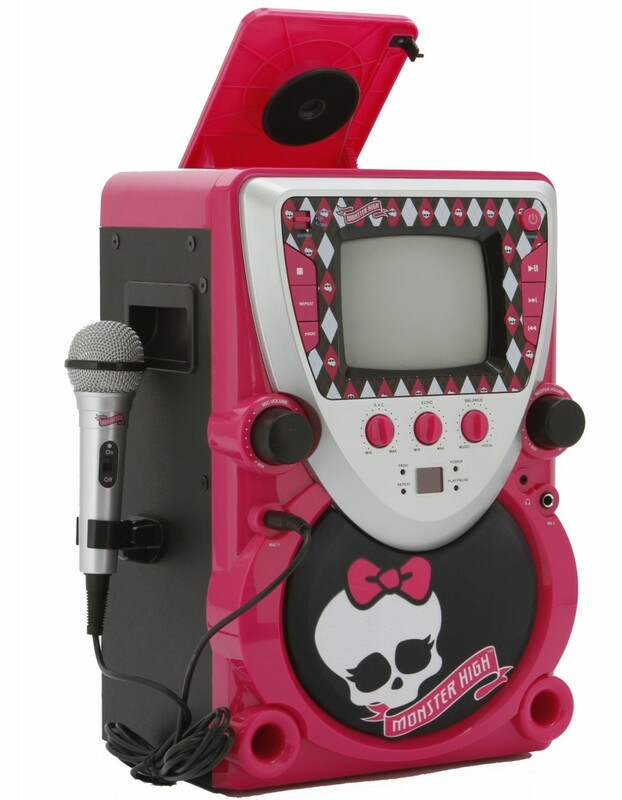 Another fun and cute pink karaoke machine for girls! It comes with a disco light effect and two microphone inputs. The Singing Machine Disco Light Karaoke System for Kids! Affordable Karaoke Machine with Cool Disco Lights! If you are looking for a fun and affordable karaoke machine for kids between the ages 5 and 12 years old, you are going to be very impressed with this cool singing machine with disco light effects! You can get it either in black or white! It’s very easy to use and very easy to connect to your TV as well! You can hook up two microphones on this machine so two kids can sing together and have a blast! The disco lights are very bright and very cool! Great fun machine for a birthday party! Great Portable Karaoke Machine for Kids and Adults! This is one of the best, most popular and most reviewed affordable portable karaoke machines for sale right now! It is perfect for children, teenagers and adults too! As you can see in the picture you can hook up your smartphone, tablet or MP3 player! It’s also super easy to connect to your TV so you can read the lyrics on-screen. The sound is very rich and it also adds echo effects if you want, so you can sound just like a pro!